Wednesday, 15 June 2011, Day 204/365. I somehow managed to get a seat this morning and surreptiously took this photo. While I don’t really enjoy catching public transport to and from work it does have its benefits. I don’t feel like driving either. Let someone else have the stress of that. I get to listen to people’s conversations on their various phones. I’d much rather do that than listen to someone’s second-hand music through their earphones. That really annoys me. Last night a woman got on with a guide dog or a helping animal. I don’t think this woman was blind. Anyway she and the dog sat right next to me and she eventually told me that the dog is still being trained. The dog was a gorgeous black labrador and because the tram was packed was nestled right up against my legs. I wanted to reach out and pat her but luckily I didn’t because there was a notice on its outfit that read, ‘don’t touch’. 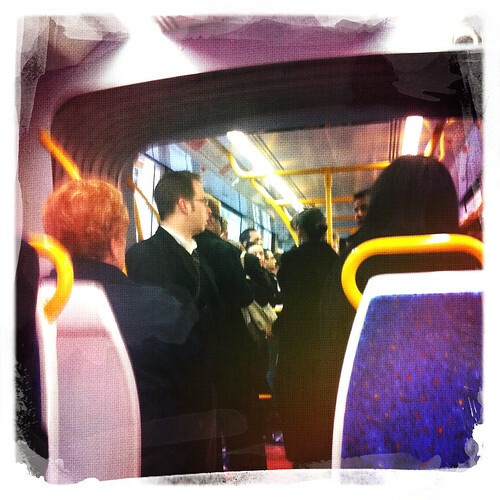 I usually have to stand up on the tram and I can handle this unless I’m feeling sick or if it’s really crowded. So, I must get ready to go and catch the tram to work today.